FeelAbouT is a powerful, energetic and exciting rock band who gets the crowd pumped up and captured by its unique and powerful vocals, tightness production and sound. Lyrics by the remarkable vocalist Roni Weinstock, music by Roni Weinstock & killer guitar player, Guy Fisher, production by one of the best Israeli producers – Eyal Leon Katzav. 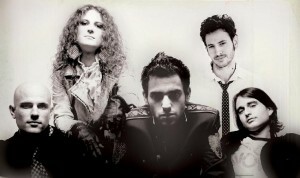 Nov 2007 – The first Israeli band to have ever take part in the prestigious “17th Los Angeles Music Awards” and to have won the title “Best Rock Band of the Year” for indie artists. May 2008 – “Follow Me Down” got over 10,000 downloads at Myxer.com, A few months later “Small Mind” won the first place in Hard Rock Videos clip on OurStage. Feb 2009 – FeelAbouT also got the attention of “Apple” & “iDigital” (Israeli Apple reseller) companies when videoed and uploaded to YouTube a live performance of “Follow Me Down” played ONLY on Apple’s iPhone and iPod touch. Feb 2010 – “Stop” Video Clip gets over 20,000 views in just 2 days! in “Mako” website – (one of the biggest Israeli internet protals). April 2010 – FeelAbouT gets to play “Boombamela” main stage festival – one of the biggest festivals in Israel! April 29th, 2010 FeelAbouT debut album ‘Point Of You’ was released. Since then the band received great coverage from the Israeli Media: radio stations, music websites, TV and fans that come to shows all over the country. FeelAbouT Is all about feeling and expressing by writing, playing and singing it out. Feeding on the everyday experience and letting it out. FeelAbouT is singed in the Israeli major label: “The 8th Note”. Has worldwide stage experience and are tour material! FeelAbouT is a powerful, energetic and exciting rock band who gets the crowd pumped up and captured by its unique and powerful vocals, tightness production and sound. The Carsitters – All Eyes on Me.